Well, the rather poor photograph at the top shows the current set-up of our Bachmann E-Z Command Dynamis Wireless Digital DCC Control System. Wow, now there's a mouthful! To make it a bit easier to understand what is shown here I have labelled the various components piled high on the shelf as well as lined up along the wall. I reckon that we now have as much as we need to operate the layout effectively, as well as being able to run several locomotives at the same time without any loss of power. What we did not know before we bought the Power Booster is that it has an internal cooling fan which is rather noisy; so we plan to hide it away in a cupboard underneath the layout. This will also mean that there will be a lot less cables dangling from the tiny shelf and leave just the Base Station and Pro Box sitting above the layout. 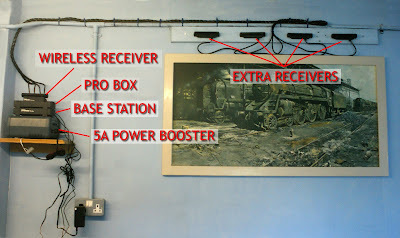 The Booster comes with a large transformer (not shown in this photo) and is connected to the Pro Box via a single cable that is supplied with the Booster. The wires to the track are connected directly to the Power Booster rather than the Pro Box and so, with the Booster hidden beneath the layout, and both it and the Pro Box plugged in to the mains beneath the layout as well, it should be both much quieter and look a lot neater. The Pro Box, as with the Base Station, allows for one Wireless Receiver to be plugged directly into it. 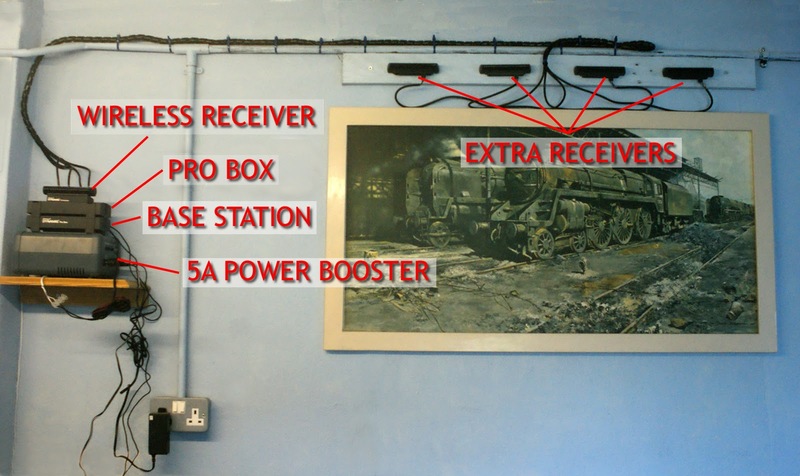 However, unlike the Base Station, the Pro Box also allows up to four more Receivers to be plugged into it. These are purchased individually and each comes with a long length of cable so that it can be positioned some distance from the Pro Box. The higher the Receivers are mounted the better it is since this will improve reception between it and the Wireless Handset, shown in the lower picture, and this, in turn, allows for more efficient running. To make things a little bit neater we have tied together the four cables running between the Pro Box and the four Receivers to form one loom. We have also placed all four Receivers fairly close to each other but they could be positioned separately and, more or less, wherever you want them, up to the limit of the cable of course. Please note that up to four Wireless Handsets can be used in conjunction with the Pro Box whereas, with the Base Station, only one Handset can be used. I think that a fifth Handset could also be used but this needs to be connected directly to the Base Station / Pro Box so is not so flexible. Obviously the more Handsets that you have the more operators you can have and, subsequently, more trains that can be running on the layout!